Once upon a time (about 200 million years ago), the land that is now New Mexico was warm, wet and tropical. It was part of a giant continent (along with Africa) about 8 degrees north of the equator roughly the latitude of present-day Panama. By this time, plants and animals had been around for a couple hundred million years: the heavy plant growth that would become our oil and coal, the fishes that became land-dwellers, and enormous insects. Among the many forms inhabiting the place was a relatively little creature only 10 feet long, but which would have stood 4-6 feet tall. Having the specializations which paleontologists use to classify them, this smaller creature would be a “dinosaur” to you and me. Coelophysis was a very early meat-eating (theropod) dinosaur which had powerful hind legs for running upright, a long tooth-filled head and jaw, and strong forelegs for grasping prey. It’s nearest known relative (perhaps a descendant) lived much later in present-day Tanzania, again reminding us of the single continent that existed in the late Triassic period. In 1881, paleontology–or the study of ancient fossils–was a very new field. That winter a scant cup-full of tiny, strange bones was collected by a prospector from two sites in northern New Mexico and mailed to the Yale Peabody Museum. In 1889, the bones were formally recognized as a new creature pre-dating the Jurassic dinosaurs and named “Coelophysis” to describe it’s hollow bones. The curious little bones stayed in storage for more than fifty years. 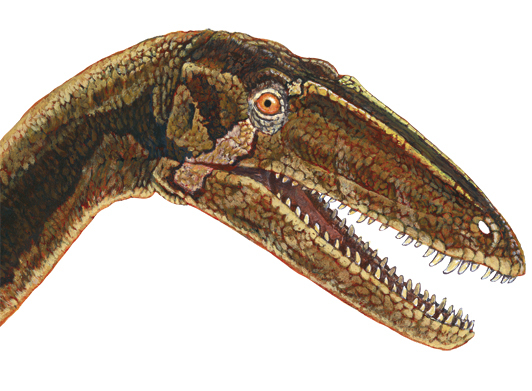 The general area where the Coelophysis bones had been found was prospected by paleontologists from 1928-1935 and numerous phytosaurs (a crocodile-like meat-eater) and other fossils were discovered. But it wasn’t until a side trip to the ranch in 1947 by paleontologist Ned Colbert and two companions that the little dinosaur Coelophysis was seen again. While walking in an unlikely spot, one of Colbert’s assistants retrieved fragments of tiny bones. Having carefully studied the stored bones at the Museum, Colbert immediately recognized the color, shape and weight of the little bones as being from Coelophysis. In short order, the three located a site which was later deemed “the greatest find ever made in the Triassic of North America” (Colbert, 1995). Eventually, hundreds of over-lapping skeletons were recovered for study. Tiny juveniles, fully-grown adults and many intact (articulated) skeletons allowed scientists the unprecedented opportunity to make statements about how this dinosaur grew, what it ate, and how it lived. This concentration of skeletons and their preserved state suggest they may have died during a flash flood which quickly buried their bodies in silt where they were fossilized. No where else than New Mexico has this early dinosaur been found. In 1981, Coelophysis was declared our state fossil. If you visit The Field Museum of Chicago or the Smithsonian in Washington D.C. or many other museums around the world you may see our little dinosaur. Or come to New Mexico and see them closer to their resting place at Ghost Ranch at the Ruth Hall Museum. Edwin H. Colbert. The Little Dinosaurs of Ghost Ranch. New York: Columbia University Press, 1995. Quote attributed to George Gaylord Simpson, curator at the American Museum of Natural History. This entry was posted in Critters, Flowers&Fauna, Nature&history and tagged coelophysis, dinosaur, New Mexico, paleontology. Bookmark the permalink. I’ve visited the museum and seen them. Very cool. Those Ghost Ranch quarries are treasures. Indeed so. Interesting that there are folks around the world who know all about Ghost Ranch not because of any association with Georgia O’Keeffe, but because of Coelophysis.